Inspired by a racing documentary, my buddy Jim bought a junky, engine-less 1969 VW bug from a guy who was about to tow the car to a junkyard. He showed the documentary to a few friends, discovered that they, too, had always fantasized about exploring their inner NASCAR driver. So they signed up to race the Baja 1000, a grueling 1,300-mile race through the Baja California desert in Mexico. 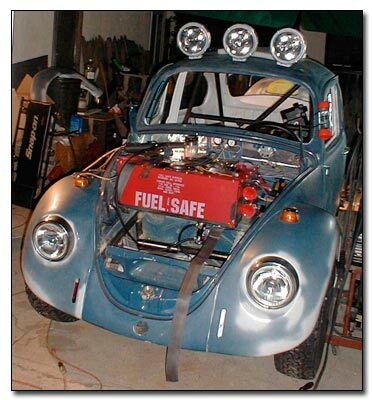 For the past eight months, they’ve spent their weekends giving major love to their Love Bug (OK, they’re really calling the car the Desert Dingo), equipping it with a new engine and enough high-tech gadgetry to make even Fry’s Electronics’ geekiest shoppers jealous. We’re talking GPS units for navigation and satellite phones for communication and Twitter updates. They’re having fun, doing it for a good cause as they raise funds for diabetes research (World Diabetes Day is Nov. 14). And at the same time, they’re not taking themselves too seriously. “We’ll average about 25 miles an hour if we’re lucky,” says Desert Dingo Racing co-owner Mike Aquino in the International Diabetes Foundation press release. Jim and his crew were just featured on a CNET photo spread. KPIX-TV (Channel 5) in San Francisco will feature them on their news show on Monday. Race starts Tuesday. Follow their progress via Twitter. Go Jim go! This is great! Good for Jim. Also it reminds me of my old ’74 Karmann Ghia, which I sold before moving to San Francisco. VWs are a PAIN, but they can be worth it. I was really sad the last time I drove that car.